Saturday February 2nd 1878 We were just getting our baking done at eleven oclock when Grandma and Aunt Mary came. We had a real pleasant visit and Grandma stayed all night. We young folks all sang in the evening. Weather pleasant. 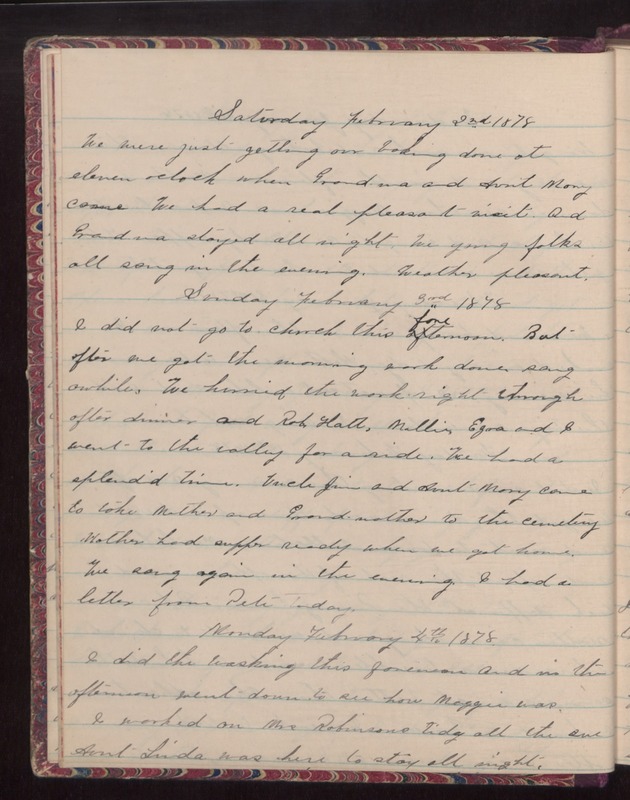 Sunday February 3rd 1878 I did not go to church this forenoon. But after we got the morning work done sang awhile. We hurried the work right through after dinner and Rob, Hatt, Mollie, Ezra and I went to the valley for a ride. We had a splendid time. Uncle Jim and Aunt Mary came to take Mother and Grandmother to the cemetery. Mother had supper ready when we got home. We sang again in the evening. I had a letter from Pete today. Monday February 4th 1878 I did the washing this forenoon and in the afternoon went down to see how Maggie was. I worked on Mrs Robinsons tidy all the eve. Aunt Linda was here to stay all night.